Based on reviews from 2,364 users. Learn how our rankings work or see our guide to Nike Air Max 97 sneakers. Updated Apr 2019. Decades ago the sneaker market was introduced to Nike's form-shifting technology that swept the masses and changed the course of the brand's history forever. Although introduced through a different sneaker, Nike's Air technology reached the level of success today through the birth of the Air Max 1. From then on numerous Air max models were born, each one progressively pushing the envelope even further than the previous model making sneaker history time and time again. However not all Air Max shoes are revered the same way as just a handful stands out and endures today. One of them is the Nike Air Max 97. Released ten years after the first Air Max sneaker was introduced, the AM97 celebrated its lineage's decennial with a bang by displaying full-length, dual-pressure, visible airbags – the first of its kind hence considered innovative then and became an era-defining classic ever since. Today Nike Air Max 97 sneakers remain prominent in the market through countless iterations and releases. With the fast-paced nature of the sneaker culture always keeping up to date and informed is difficult. Here's a one-stop source to brush up on everything Nike Air Max 97. The Nike Air Max 97 is one of those sneakers that is either loved or hated by consumers. With cutting-edge design, it is said to define and represent its era's change in culture and popular taste. However, as much as it is very much of its time, it is also futuristic and timeless which could explain why the sneaker remains steadfast after three decades of existence. To get a grip on the shoe's general aesthetic, here is a breakdown of what defines Nike Air Max 97 sneakers' physical characteristics. Unusual yet ingenious, the AM97's upper is inspired by nature's natural occurrence – raindrop's ripple effect that extends across the water. The design provides an unprecedented look to the sneakers, a subtle yet profound aesthetic, which intrigued consumers. Moreover, almost all Nike Air Max 97 sneakers feature 3M reflective treatments on its upper aimed to help keep night runners safe. Building on its predecessors' fractional Air unit systems, the Nike Air Max 97 took it a step further and introduced the first-ever full-length visible Air unit. It features an interconnected unit to create a unified forefoot and rearfoot Air bag encased in a transparent midsole material. The AM97’s lace-up system was considered innovative during its release and is recognized to have pioneered alternative lacing system designs. The eyelets of Nike Air Max 97 shoes are attached underneath the upper displaying a more minimal aesthetic up top, while a strip of material runs through the tongue providing loops to help keep laces and tongue in place. With a rich history and an ongoing successful run, the Nike Air Max 97's evolution into various versions is inevitable and natural. We've seen Nike Air Max 97 sneakers dressed in different colors and materials, we've also read different and often-confusing official shoe names but here are some of the most notable iterations dissected and explained. Although almost all Nike Air Max 97 shoes are crafted from a combination of leather and mesh, the OG is specifically mostly covered with leather. This is where the Nike Air Max 97 Ultra 17 remixes it up as it comes in a predominantly mesh upper with a few leather reinforcements, providing a sleeker look and lighter feel. The material update aligns with today’s lightweight and breathable footwear trend. This version also comes in other varieties such as the Nike Air Max 97 Ultra ’17 Special Edition (SE) and Nike Air Max 97 Ultra 17 Seasonal Innovation (SI). This group of Nike Air Max 97 shoes distinguishes itself from the rest by displaying a more eccentric and electric style. From funky color schemes to eclectic prints, this sub category of the Air Max 97 caters to consumers who have adventurous fashion tastes. Pairs that belong in this group would appeal to the youth, youth at heart, and street-savvy consumers. The following are a number of colorways that this kick was released in. In April 2018 the Swoosh brand teamed up with world-renowned football player Cristiano Ronaldo and together added another iteration to the ever-growing collection of Nike Air Max 97 sneakers. The official name stands for the initials of Cristiano's name and his shirt number. Ronaldo's rendition of the Air Max 97 featured patch works throughout the upper reported to pay homage to the footballer's childhood. Ronaldo grew up in a poor household and only had two pairs of shoes, one for school and the other for playing soccer. Since he was always in the field, his soccer shoe instantly tore, and his mother would put patches over the holes to make them wearable again. Thanks in part to several reissues and endless colorway releases the Nike Air Max 97 amassed such a massive and loyal following that the shoe remains a hot commodity three decades after its inception. From blue, black, pink, grey, yellow, orange, gold, and the iconic silver, colorways are not equally revered as some eclipse others when it came to fame. Here are some notable color schemes of the Nike Air Max 97 shoes to give you an idea which hues helped the shoe catapult to cult status. This colorway is the most famous shade of the AM97, and it is safe to say that it played a big part in helping the shoe reach its iconic status today. Before the release of the Nike Air Max 97 "Silver Bullet" the market had never witnessed a sneaker bathed in metallic colorways. This hue was a great finishing touch to the shoe as it complemented its groundbreaking design and technology. Hence when the shoe debuted in 1997, consumers were intrigued. From then on Nike Air Max 97 sneakers bathed in this colorway would almost always sell out immediately. Often in retail business when there's silver, there's also gold. This colorway is the second most well-loved hue of the Nike Air Max 97. Next, to the Silver Bullet the Metallic Gold is considered one of the range's classics and mainstays, and for a good reason as Nike Air Max 97 sneakers in Metallic Gold had nailed the jackpot when it comes to making gold look fashionable and wearable. Its rarity and fashion-forward look had consumers enamored for decades. Although this is technically a hybrid sneaker, the shoe’s eclectic AM97 upper is the main act of the show. Crafted with stylish corduroy upper bathed in a never before seen mix of various pastel hues, it instantly captivated the sneaker world. The shoe took inspiration from 80s colors and Nike vintage corduroy hats, while its unorthodox backstory adds interest and value to it as an ordinary sneakerhead and vintage collector designed it. No other colorway embodies the 90s as the Grape colorway. First made famous by the classic Jordan 5, the Grape had been used in many Nike silhouettes since. This time the Air Max 97 dons this iconic colorway in a women's exclusive release. Donning a predominantly white look the hits of Purple and Teal add a pop of vibrancy to the shoe and offers an eye-catching design. Bathed in a mixture of White, Pink Blast, and Kinetic Green, this Nike Air Max 97 sneaker is perfect for summer and parties on the beach. Borrowing cues from the iconic South Beach Lebron 8, the colors perfectly complement the AM97's aesthetic. It was introduced in March 2018 with a retail price of $160. However resale prices pumped it up somewhere between $179 and $300. Another marketing strategy that most brands do is collaborations. By tapping other relevant brands to partner up with them and release a collaborative piece, Nike gets the attention of the other brand’s fan base hoping to get them on the Swoosh train as well. Moreover, dishing out new designs with the help of other companies help keep a specific sneaker model visible and afloat in the sea of fast-paced releases. Here are some of the noteworthy collaborators of various Nike Air Max 97 shoes. The collaboration between OFF-WHITE and Nike Air Max 97 was introduced through “The Ten” collection, which featured ten iconic Nike sneakers reinterpreted and deconstructed by OFF-WHITE’s designer Virgil Abloh. The collection included the following Nike models: Jordan 1, Air Presto, Air Force 1 Low, Zoom Fly SP, React Hyperdunk 2017 Low, Air Max 90, Air VaporMax, Blazer Mid, and of course the Air Max 97. The “Queen” colorway is part of Serena Williams’ Queen collection and was designed by Virgil Abloh. As the AM97 celebrates its 20th anniversary, the famous LA sneaker store called Undefeated also commemorates its 15th year in the industry, and both brands decided to team up and release a collaborative sneaker to celebrate with their loyal fans. The shoe comes in two colorways with hits of red and green that wraps around the entire upper with ‘UNDEFEATED' written on it. This collaborative piece was launched at $180, but since most sneakerheads still covet it, resale prices soared up to $400 to $1,500. The King of Grime aka Skepta, a British-Nigerian artist, has been a mainstay in the brand's long list of collaborators. Their first team up was reported to be back in 2012, but this time the two partners up again for a number of collaborative sneaker models that utilize the Nike AM97, or some parts of it at least. Released in September 2017, this sneaker comes in a multi-color, vivid sulfur, and black colorway and took inspiration from the people of Morocco. Primarily an Air Max hybrid, this sneaker utilizes the BW's upper and the AM97's sole. The British rapper chose this sneaker model as his next subject, and this time displays the colors Summit White and Hyper Cobalt. It was released in May of 2018. We all know that Nike will always be rooted in sports, but with the industry's shift of focus to leisure-inspired pieces recently, a seamless fusion of the once separated categories has taken place. Today's athleisure trend blurs the lines between athletic wear and lifestyle wear, and its influence had trickled down to sneakers. The Swoosh brand now offers hybrid sneakers that combine an upper from one of their models and fuses it with another model's sole. Here are some of the hybrid sneakers that involve Nike Air Max 97 shoes released by far. The past meets the present with Nike’s Air VaporMax 97, as it combines the iconic upper of the celebrated Air Max 97 with the latest innovation of Air technology through the Air VaporMax’s sole. It resulted in a fresh silhouette that aims to commemorate the milestones of the Air technology through its futuristic yet vintage aesthetic. Check this shoe out in these available color options. The hybrid Air Max 97 Plus debuted on Holiday 2017. It borrowed the Air Max Plus' upper and paired it with the iconic sole of the Air Max 97 resulting in a futuristic 90s kick through and through. Often nicknamed as the "Tuned Air," the Air Max Plus' loud and bold caged upper perfectly complements the subtle yet profound look of the AM97's full-length Air sole. It is also dubbed as the Nike Air Max 97/Tn, as the ‘Tn' stands for the Air Max Plus' "Tuned Air" moniker. Here are some of its color options. This version, put simply, merely reversed the tooling of the previously discussed sneaker. The Nike Air Max Plus 97 now utilizes the AM97’s upper and combined it with the Air Max Plus’ sole. Although different sneaker sites often get these two shoes’ names mixed up, Nike’s official site depicts and describes the distinction between the two very clearly. Again, take note that some people call it the Nike Air Max Tn/97. Check this half-bred kick in these colorways. A British grime artist named Skepta helped make this hybrid shoe popular. It fuses the Nike Air Max BW's upper and the Air Max 97's sole. The BW is also known as the Air Max Classic which was initially released in 1991 as part of Nike's International series. The ‘BW' stands for Big Window referring to the visible Air unit in the heel. It has been released in various colorways. The brainchild of Sean Wotherspoon, this sneaker helped revive Air Max's presence in the market. It took the Air Max 97's upper and put it atop the Air Max 1's sole. This design looks relatively simpler compared to the previous hybrid sneakers discussed, but its backstory and unique hues and materials served as a breath of fresh air for most enthusiasts. For now, the Nike Air Max 97/1 is available in its original multi-colored number, but the brand has recently confirmed that new colorways are in the works. Are Nike Air Max 97 sneakers true to size? With the rise to fame of online shopping questions in sizing inevitably follows suit. As online consumers don't have the option of trying the shoe first, they rely on their fellow netizen's word and reviews. However, there are a few things we, as online shoppers, need to take into consideration first before purchasing. First, every sneaker model released could have a different size due to a change in materials used or a slight alteration in the details. Second, every foot is shaped and sized differently which means you could have a different set of needs making your experience unique from the person next to you. According to the brand's size chart, the size difference between their men and women's shoes is one size, with the men's being the bigger one. Nike adult sizing is based on US adult sizes. Here a couple of Nike Air Max 97 shoes grouped according to the consensus of the reviewers' feedbacks. Do all Nike Air Max 97 shoes feature its signature reflective detail on their uppers? Being designed as a running silhouette, 3M hits were added on the AM97's upper to help night runners stay visible and safe in low-light conditions. Although initially applied for functional purposes, consumers found its innovative design fashionable and unique that the reflective details became synonymous to the shoe and recognized as one of its signature features. Most released Nike Air Max 97 sneakers display this detail and, so far, there aren't any reported AM97 models without this feature. But with the fast-paced nature of sneaker release, there's a possibility that the reflective detail has been omitted on one of their Nike Air Max 97 sneakers. How much do AM97 sneakers cost? Nike Air Max 97 sneakers belong in the higher part of sneaker price charts. Its intricate design, rich heritage, innovative concept, and technologically equipped construct are probably the rationale behind its pricey cost. However, in the grand scheme of the sneaker world, prices of Nike Air Max 97 sneakers are never a hindrance for enthusiasts. 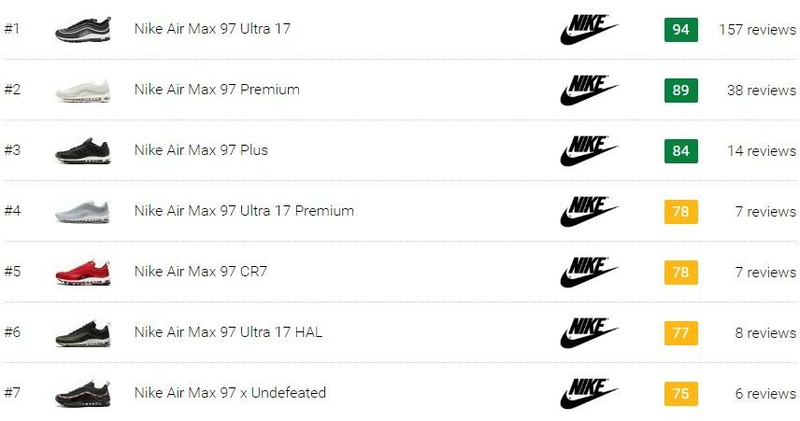 Here’s a scope of Nike Air Max 97’s price range. How to style Nike Air Max 97 shoes? Outfitted in a retro yet futuristic styling, the AM97 offers an enduring aesthetic that has proven to transcend trends. Its detailed yet sleek looking low-top silhouette provides versatility in matching with a multitude of casual ensembles while adding oomph to it at the same time. Here are some outfit ideas you could try on an everyday basis. 90’s inspired: cropped wide-legged trousers, a printed polo shirt, and a 5-panel cap. Athleisure: sweatpants and a long-sleeved graphic top. Laidback sporty: cropped hoodie, sweatpants, and topped off with a dad hat. Feminine edge: Midi skirt and a vintage tee or a dress. Fashionista’s off-duty look: matching suit. Are these sneakers good for running? Working out? Walking? Initially designed as a running shoe, Nike Air Max 97 sneakers are technically equipped for these aforementioned activities. However, being virtually unchanged since the 90s its comfort, support, and weight would not be at par with today’s modern running sneakers. What’s more is that it is currently marketed under the lifestyle category which houses sneakers for every day and more on the fashion side. Is the Nike Air Max 97 vegan-friendly? Unfortunately for vegan enthusiasts of the shoe, most Air Max 97 sneakers are not vegan-friendly. 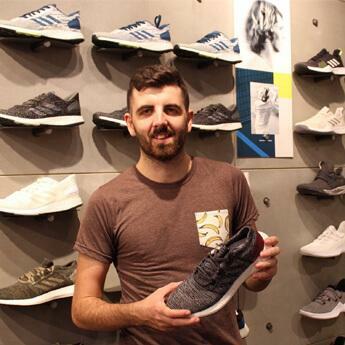 Majority of the sneakers in this range utilize leather for some of its parts which offers very limited options to vegan consumers. However, one of Nike’s hybrid sneakers is. The Air Max 97/1 that was designed by Sean Wotherspoon (who’s also a vegan) is reportedly crafted from animal-free products. The only downside is due to its super limited nature getting your hands on a pair could be difficult and expensive. How to spot real vs. fake Nike Air Max 97 sneakers? Unfortunately, fake Nike Air Max 97 shoes are being sold in the market today and to get the bang for your hard-earned buck, checking for telltale signs of a counterfeit kick is recommended. Here are some tips on what to look for before making a purchase. Check the Swoosh logo on the tongue it should be occupying most of the oval patch. If it appears smaller and does not take up most of the patch, then it could be a fake. The heel tabs should have the words “air max” plastered across it, and check if all letters are consistent in size. If any of the letters look bigger or smaller or if it doesn’t have anything on the heel tab, then it is fake. Cheap materials and poor craftsmanship is a big giveaway in trying to find out if your pair is a counterfeit. The Swoosh logo on the outsole of the shoe should be placed precisely in the center. If it looks otherwise, then don’t cop it. Take note of the colorway. If the combination of hues doesn’t appear in any of the sneaker sites or are never documented, it is most likely a fraudulent pair. When was Air Max 97 released? Who designed it? The fashion-forward Air Max 97 had been released in 1997. Thanks to one of its predecessor's equally groundbreaking and innovative design, the AM97 had instantly hit off in pop culture worldwide. Designer Christian Tesser took inspiration from nature, mountain bikes, and eventually bullet trains. The upper’s sleek lines mimic the ripple effect in water every time droplets of rain hit it. The OG Silver Bullet colorway was initially borrowed from mountain bikes and later came the bullet train reference for marketing purposes. Why are Nike Air Max 97 shoes so popular? The AM97's aesthetic is considered unprecedented then and today. Some models have been fashioned after it and tried to imitate, but nothing even came close to the Air Max 97's unique appeal. The perfect blend of retro classic and futuristic design elements provided the shoe its distinct identity – an identity that looks vintage and represents its era well and fashion-forward at the same time. Lastly, its legacy of being the first footwear ever to incorporate a visible full-length Air cushioning system will always be an extraordinary feat and the reason why the shoe made it in the history books. Air Max 97 or VaporMax Plus? As this is an opinion-based question, the answer is subjective - it all depends on the person's unique preferences. However, as common knowledge has it, most people look for two important factors before purchasing a pair: comfort and style. With the Air Max 97 being a retro kick, it is to be expected that the newer VaporMax Plus would exceed it in terms of comfort. But most enthusiasts insist on copping Nike Air Max 97 sneakers instead due to its iconic status, classic aesthetic and adequate comfort. Ultimately, if you value comfort over style, then the Nike VaporMax Plus is the better choice. On the other hand, if you're good with the AM97's adequate comfort and want a more fashionable pair then go for the Nike Air Max 97 sneakers.